A 3 season sunroom installed by SRA Home Products can make a great addition to any home in and around King of Prussia, Pennsylvania. If you love being outside but dislike having to deal with the bugs, inclement weather, and windblown debris that come along with it, a 3 season sunroom may be just the solution you have been waiting for. At SRA Home Products, we have completed more than 5,500 outdoor living projects, making us a leader in this industry. In fact, our employees have been with us for an average of 15 years each, and are also factory-trained and -certified, so you can trust that they have the experience necessary to get the job done right the first time. 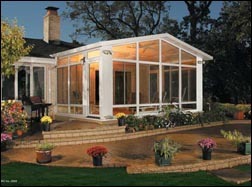 Call SRA Home Products today to learn more about having a 3 season sunroom installed at your King of Prussia, PA home, or to schedule a free at-home consultation.